In many recent crash reports a trailer is found somewhere on or near the crash scene. Surveys confirm that many trailer owners are not fully aware of the safest method of towing cargo. We need to recognize that safety information is important for many others than trailer owners. There are many businesses renting trailers and many drivers will rather rent a trailer when the need arises. Without experience & required attention to safety procedures towing a trailer becomes a danger to the driver, his load and other road users. Driving when towing a trailer requires additional knowledge, safety precautions and driving skills. The driver must be aware of challenges such as decreased acceleration and braking performance, reduced vehicle control and manoeuvrability etc. Driving specialists advise that those not familiar with towing a trailer practice the necessary manoeuvres in an empty car park/ parking lot before driving on a public road. This is also the right time to test braking. There are many different types of trailers in all shapes and sizes. In this section we will be focusing on your average small trailers that attach to cars and SUV’s. The first question before loading and connecting the trailer should be “Is it legal?” The obligation is on the driver to ensure that the trailer is towed in a manner that does not breach road traffic legislation and which makes both the vehicle and the trailer roadworthy. Legislation might not be the same if you are crossing the border – enquire to ensure you comply with the law in the relevant jurisdiction. A registration certificate / licence disk. The speed limit when towing. Towing capacity of a specific vehicle. Required stopping distances / Brake requirements. Height and width / overhang restrictions. Flags and warning panels required where there is overhang of the trailer towed. Restrictions with regards to specific unique loads carried. Whether towing more than one trailer is allowed. Whether carrying of passengers is prohibited or allowed. Requirement of extra mirrors for towing large trailers. Some European countries require spare bulbs, a warning triangle, a fire extinguisher and a first-aid kit as legal requirements. The vehicle and trailer must be in a roadworthy and safe condition. The first step should be to pay attention to the vehicle manufacturers guidelines on weight limitations and other requirements when towing a trailer. Some modern vehicles have advanced technology to assist with towing of trailers. These include TSP or the Trailer Stability Program, helping to correct the ‘snaking’ action of a trailer. Your average vehicle may not have this and requires attention to specific vehicle components. Check tyres by looking for cracks or bulges on the sidewalls. Check for minimum tread depth, flat spots, uneven wear, and objects caught in the tread. Be even more cautious inspecting the small tyres on light-duty trailers. Check trailer brake and light connections. Be sure the lights on your trailer work – Have another person stand behind the vehicle to check the brake lights and turn signals for proper operation. Check to ensure the tow coupling and brake mechanisms are well lubricated. Jack the trailer up and spin the wheels, listening for rumbling noises which indicate worn wheel bearings. Ensure that tyres are inflated to the manufacturer’s recommended level. Check that wheel-bearings, suspension and brakes are in good working condition. Check oil, water, brake fluid, battery. Tow bars and tow couplings – Ensure the coupling socket and ball are matching size. Coupling must be securely fastened and latched or screwed down when the trailer is connected to the towing vehicle. Safety chains must be properly connected with attachments capable of withstanding the specified breaking load of each chain. Ensure all doors, hatches, covers and any load or equipment are properly secured. The upper limit to the weight of a trailer a vehicle can tow. This is usually expressed in terms of kilograms. There may be a requirement that a sign indicating the maximum trailer weight (and in some cases, length) be posted close to the coupling device. The total mass of the laden trailer when carrying the maximum load recommended by the manufacturer. The mass transmitted to the ground by the axle or axles of the trailer when coupled to a drawing vehicle and carrying its maximum load uniformly distributed over the load bearing area. The maximum weight of the trailer and tow vehicle combined is the gross combination weight rating (GCWR). The towing capacity of a vehicle if the trailer being towed has its own braking system, typically connected to the vehicle’s braking system via the trailer cable. Braked towing capacity is typically significantly greater than unbraked towing capacity. 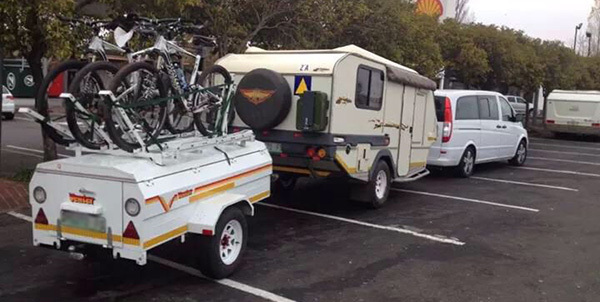 The towing capacity of a vehicle towing a trailer that does not have its own braking system. The section of the trailer that extends out to connect to the tow vehicle is the tongue. A weight-distributing hitch has special equipment designed to spread the weight pressing down on the tongue to the axles of both the tow vehicle and the trailer. On the tow vehicle side, you have the trailer hitch receiver, which attaches directly to the tow vehicle. On the end of the tongue is a coupler. The ball from the tow vehicle fits into the coupler. The coupling on the trailer must have a manufacturer’s rating appropriate for the gross laden weight of the trailer and be compatible with the tow ball size. The coupler attaches to the trailer hitch receiver — you use a locking pin to secure the mount to the hitch. On top of the ball mount is, naturally enough, a ball. The size of the ball will determine the type of trailer you’ll be able to hitch to your vehicle. The safety chain attachments must be mounted adjacent to the tow coupling and arranged so as to maintain the direction of the towed vehicle in the event of coupling failure or disconnection. Safety chains should be crossed under the tongue to prevent the tongue from dropping to the road should the primary hitch accidentally disconnect. It is recommended that chain hooks have latches or devices that prevent accidental disconnect. The breaking strength of each chain should equal the gross weight of the towed trailer. Brakes fitted to a trailer, whether or not they are legally required, must be in good working order. Trailers may be required to have service brakes, parking brakes, breakaway brakes or safety chains depending on the gross laden weight of the trailer. Some trailers are fitted with a hand brake. They are useful for controlling and braking trailers when not connected to the vehicle & as a temporary brake when positioning chocks under the trailer’s wheels to permanently secure the trailer. Newer tow vehicles usually have a connector stowed in a convenient location. With an older vehicle, you may have to connect the trailer’s electrical system through your taillights. The first step to safety would be to avoid overloading the trailer. Overloading any vehicle creates significant risks – so much more if the trailer towed is overloaded! Overloading a vehicle can compromise the vehicle’s body, brakes, chassis, wheels and/or engine. In this section we would like to look at both avoiding overloading and also correctly loading the trailer. How much weight can the towing vehicle pull safely? Consult the owner’s manual for guidance. How much weight can your trailer hitch and ball mount handle (tongue weight)? You can adjust tongue weight either by using a weight-distributing trailer hitch or by balancing the load inside the trailer itself. What is the Aggregate Trailer Mass for the specific trailer – How much weight can the trailer safely carry? Ensure that mass/ weight specified by the trailer manufacturer is not exceeded. How much will the trailer weigh when loaded? This is called the gross trailer weight (GTW). What would be the Gross Combination weight rating? The maximum weight of the trailer and tow vehicle combined is the gross combination weight rating (GCWR). Establish what the road legislation stipulates and what the manufacturers guides suggest for both the towing vehicle and the trailer towed. Even when the load mass and towing weights comply with the law it is not to be assumed that the trailer is loaded correctly for safe towing! The driver needs must ensure that the load inside the trailer is balanced properly. Unbalanced loads can cause problems like trailer sway on the road. Ensure that the centre of gravity (CG) is towards the front of the trailer, usually around 10 – 20cm ahead of the axle. When towing a trailer, you’ll want to load it to attain a 10-15 percent tongue weight. Downward force at the point of attachment improves the handling characteristics when towing. It is best to distribute 60 percent of load over the front half of the trailer (nearest to the towing vehicle). Contents must be evenly distributed on both sides of the trailer. Once the trailer has been loaded and the weight is distributed properly, all cargo should be secured to prevent the load from shifting. Should a part of the load be removed during the journey, you may need to rearrange and re-secure the rest of the load. Loads carried on trailers should be properly restrained so they can’t shift around while the vehicle is moving. Securing loads can be done by packing them inside compartments that are rigidly attached to the vehicle, by lashings (webbing straps, ropes, chains) or clamps securely attached to appropriate anchorage points (rails, hooks or eyes) on the trailer. Always keep in mind when securing loads that they try to move forwards when the vehicle brakes, sideways when the vehicle turns, backwards when the vehicle accelerates & upwards when the vehicle goes over bumps. Make sure the equipment is a safe& roadworthy match – if the trailer’s coupler doesn’t match up to the ball on the ball mount, you can’t tow with that trailer safely. The coupler on the tongue of the trailer must fit over the ball on the trailer hitch ball mount securely & be snug on the ball when locked. The coupler should have a securing device that you’ll need to lock into place, preventing the coupler from detaching from the ball mount. Check the connection by pulling up on the trailer to try to pull it off the hitch, which you shouldn’t be able to do. If you can pull the hitch off, it must be reattached. Check the clearance of the connection, and make sure any wheel or stand for the trailer is in the up or drive position. Attach safety chains to the trailer tongue and your trailer hitch. The chains serve as a hitch of last resort. The chains should cross underneath the tongue of the trailer. Should the trailer break away from the hitch, the chains will be able to support the tongue. There must be some slack in the chains as tight chains will inhibit your ability to make turns. Check and set your Tongue Weight – Swaying trailers are almost always the result of insufficient tongue weight, because adding tongue weight adds stability. Industry-wide, the target recommendation for tongue weight is 10 to 12 percent of total trailer weight. Connect and plug into the tow vehicle’s electric system. Industry-standard plug and socket wiring and color-coding scheme should make it easy to install the connector properly to the tow vehicle’s harness. It is very important that the brake lights work on the trailer. If they don’t, motorists are unable to tell when you are slowing (and in the dark, they won’t be able to see you at all). New basic trailers might have a simple four-way connector. Each connector controls a different function. A four-way connector could supply power and control to taillights, brake lights, turn signals and side marker lights. Spray the contacts with dielectric grease to prevent corrosion. Safe towing requires a regular review of the equipment, including the hitch and signals, as well as some extra safety and clearance precautions to ensure a secure drive. Check tyre pressures, and look for signs of wear or damage. Clean all lights and reflectors. Check all lights are still working. Check that the load is still secure and that it has not moved. Inspect webbing straps and ropes (they can be damaged by wear, chemicals, heat, light, excessive knotting, bending, or chafing). Check all tie-down points are tight. Towing a trailer can be challenging –requiring much thought and increased driver attention. Adding a bit more weight to the rear of your vehicle can significantly change driving stability. Pay more attention to pre-trip planning. Enquire about the roads to avoid any potential height obstructions such as bridges or tunnels. This is especially important if driving with a boat or other tall objects in tow. Consider weather conditions and be especially careful when driving in fog, rain, icy conditions or on bumpy roads. Allow extra driving time to get to your destination. It is advised to plan more rest stops and shorter travelling days as towing is more stressful and tiring than normal driving. The more awareness about the towing vehicle and trailer the easier it may be to make the correct decisions while driving. Be aware of the size of your trailer and the height of the load carried. This is important when driving, parking or driving on roads where there may be height restrictions. You may also need to allow for the extra length and width of a trailer when entering traffic and allow for its tendency to “cut in” on corners and curves. If you’re towing a trailer that has a wider wheel base than your tow vehicle, you may need to replace your normal side view mirrors with a larger set or use mirror extenders. Finding and positioning the centre of gravity of the trailer is the secret to successful towing. When towing a trailer, the centre of gravity needs to be just in front of the trailer’s wheels, so that the trailer follows perfectly behind it. Take it slow and stay in control – Maintain a speed that will avoid sudden stops and slow-downs. Engage a lower gear in both manual and automatic vehicles when travelling downhill to increase vehicle control and reduce strain on brakes. Brake well before cornering and reduce cornering speeds. The vehicle will work harder to accelerate and brake, putting more wear and tear on the vehicle, suspension, brakes and other components. More space is needed to slow down or come to a stop, necessitating an increased following distance. Speed too fast for the conditions is one of the factors causing a trailer to sway. A moderate driving speed will help to avoid trailer sway. Reducing speed is also important when driving in bad weather conditions. Avoid braking on slippery surfaces. Only overtake when you are certain there is sufficient space and time to do so. Monitor traffic behind for other stronger vehicles that wish to overtake. Pull in to allow long queues to pass, especially on mountain roads. Indicate your attention to overtake well in advance. Never overtake another vehicle on a hill or if there is an uneven road surface up ahead. Be aware of the pull effect when overtaking large vehicles. Aerodynamics will pull you towards the truck when overtaking. After finishing the manoeuvre, your vehicle may be pulled in the opposite direction. Allow for sufficient distance ahead of the overtaken vehicle before returning to your lane. Avoid “cutting off” the overtaken vehicle when returning to the left lane. Why do trailers jack-knife and how can a driver avoid this? Trailer sway is most often caused by a combination of incorrect loading, poor load distribution, excessive speed and strong winds. Thought, planning, and alertness are the most important requirements to prevent sway from starting. Get into the habit of checking the mirrors for trailer swing. A sway usually starts off as minor as the wheels of the trailer loses traction with the road surface. Under certain conditions, the sway could get worse; the trailer begins to move back and forth, gaining momentum on each swing. Unchecked, the trailer could cause you to jack-knife. Trailer sway can be terrifying and difficult to correct. If the trailer is fitted with brakes that can be operated independently, apply them gently otherwise continue at a steady speed or accelerate slightly until the sway stops. Don’t climb on the brakes – Once the trailer wheels grip the road again, the trailer will start to follow the towing vehicle and straighten out. The best way to stop any skid is to get off the brakes and let the tyres restore traction. Once off the road, try balancing the trailer load. If that doesn’t solve the problem, stop driving and call for help — trailer sway has led to several accidents, some of them fatal. When towing a trailer, your vehicle has much more mass than normal. This mass has momentum and inertia. Inertia is the tendency for an object to maintain its current state of momentum. Your tow vehicle will have to work harder when pulling a trailer and will require more energy to move and stop. The larger the load, the longer it will take you to stop. Suddenly braking the car could cause the trailer to slide or the even jack- knife. Allow a four-second gap between you and the vehicle ahead – even more if it’s wet or windy. It is advised to test the stopping power of your vehicle and trailer before you have to stop suddenly. Drivers should allow extra room and take turns wider than normal. Drivers pulling trailers must overshoot their turns, taking them wide enough so that the trailer’s path does not put it off the road or in contact with telephone poles or other street-side obstacles. The trailer’s wheels will be much further to the inside of a turn than that of the towing vehicle. A driver who is not cautious when making turns risk hitting a curb or other object, which could cause damage to your trailer’s wheels and axle. If you start a corner too tight and get into trouble, stay calm and stop. Make sure the road behind you is clear, back up a little bit, and take the turn again a bit wider. Whenever possible ask someone to guide you when reversing or parking and take it slowly. Gradual, slow movements are recommended as over steering can cause the trailer to turn sharply. Keep your movement of the steering wheel to a minimum, and remember, you can pull forward to straighten out. If you are struggling, do not be afraid to start the manoeuvre again if needed. Start reversing with the vehicle and trailer in the same straight line. Slowly reverse the trailer, turning the vehicle in the opposite direction to the one in which you wish the trailer to turn. As the rear of your vehicle turns away from the direction you want the trailer to travel, the rear of the trailer will turn in the direction you wanted. Should you continue too far the vehicles will jack-knife – the situation where the angle between the vehicle and the trailer it is pulling is less than 90 degrees, or beyond an L shape to a V shape. Once the trailer is moving in the right direction, reverse the steering on the vehicle and follow the trailer into the turn and finally straighten it up when you reach the correct direction. Generally, frames that are long compared to the wheelbase of the towing vehicle are easier to reverse than those that are short. Always be ready to adjust your driving to challenging conditions. On hot days, beware of engine overheating on long climbs – Using a lower gear will keep the engine cooler. Use a lower gear when travelling downhill to increase vehicle control and reduce strain on brakes. Avoid sudden steering manoeuvres and changes in direction while driving that might cause the trailer to sway. Be gentle with the accelerator, brakes and steer smoothly to avoid sway, especially in wet or slippery conditions. Driving will be more affected by gusts of wind and wind shift caused by large trucks when driving with a trailer. Look further ahead than normal so you can react to changes in traffic or road conditions. With awareness of the risks and attention to safe driving techniques drivers can make informed decisions on the road!